Cowspiracy Documentary: "The Film That Environmental Organizations Don't Want You to See"
Cowspiracy: The Sustainability Secret is a feature-length environmental documentary following a San Francisco filmmaker as he investigates the most destructive industry facing the planet today: large-scale animal factory farming. As he investigates, he encounters a surprising resistance to discuss the subject amongst the very organizations he expected to find leading the charge against the industry. The film then takes a two-pronged approach: exposing the environmental destruction caused by factory farming and investigating just exactly why the world’s leading environmental organizations seem too afraid to talk about it. The film was written, directed and produced by Kip Andersen and Keegan Kuhn. Together, they devoted over a year to researching, filming and producing the documentary. 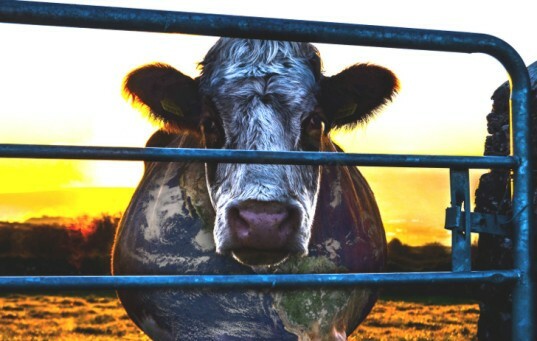 As the filmmakers say: “Animal agriculture is the leading cause of deforestation, water consumption and pollution, is responsible for more greenhouse gases than the transportation industry, and is a primary driver of rainforest destruction, species extinction, habitat loss, topsoil erosion, ocean ‘dead zones,’ and virtually every other environmental ill. Yet it goes on, almost entirely unchallenged.” The documentary’s website has a very thorough fact check round up on the topic here, with ample links to authoritative sources for some hair-raising statistics. Andersen fronted the documentary, and as he approached leaders in the environmental movement he increasingly uncovered what appears to be an intentional refusal to discuss the issue of animal agriculture, while industry whistleblowers and watchdogs warn him of the risks to his freedom – and even his life – if he dares to persist. As Anderson notes, he has been taking short showers to save water like an environmentally responsible citizen, but it turns out that the more than 600 gallons of water used to produce one hamburger is equivalent to two months’ worth of his showering! So why is it that the problems with large-scale factory farming aren’t front and center of the fight against carbon emissions and climate change? Of course, you’ll have to see the film for the answers. For a list of screenings, check out the Cowspiracy Facebook page. You can also organize free screenings of Cowspiracy through Tugg. DVD and digital downloads of the film are also available for pre-order through the film’s website, with an expected release in those formats on 6 November, 2014.